OK, so I didn't gift the sweet bride-to-be my anxiety. I like her too much to pawn this host mess of a human issue off on her. But I am pretty plum proud that I was able to turn my near meltdown due to anxiety into a pretty adorable bridal shower gift. It starts with the day of the shower and me finally running out at lunchtime to buy a gift. Way to be on top of life, KK! But I digress...it was lunch and I went to a store I have managed to avoid for about a decade, Bed, Bath and Beyond. It's the "Beyond" that kills me in there...oy! Except that I pulled up to where I thought it was, only to realize it had moved years ago. Quick texts exchanged with District and I was back on the road to the correct location. In I went...to the "Beyond." I could feel my anxiety welling up with just the first foot in the door so let me spell out my foggy head issues in hopes I can help you understand. First, it smells in there. Not like stinky foot smells. But all the smells. They sell a gazillion candles and scented everything ever made for your house products. And my hyper sensitive nose just does flip flops and majorly overreacts to stores with all-the-scents coming at me full force. Even in a nicely appointed candle or homemade soap shop, I find myself running for the door. It's just too much for me. Second, there is SO MUCH STUFF. Floor to 15' ceiling, just jam packed with product, product, product. And I know that to many, this is a dream come true. So many choices and so many colors and so many scents and so many textures and so many of everything. But to me, it feels physically encroaching and very overwhelming. My reaction is very physical. Internally I feel nauseous and tight. Externally I feel warm and get flushed. Anxiety is real, my friends. And it crops up sometimes in unexpected places. Like Bed, Bath and Beyond. So I can't figure out who works there or where I should go to find a registry. I printed an item I intended to buy but I couldn't find it and don't think this store carried it. I sort of walked in circles, which could absolutely be a metaphor for how I was feeling at that moment in time too. I was melting down next to the tablecloths. Truly tears were bubbling up and I was having hot flashes and needed to get out of there. As I was walking to leave, I spotted some wooden spoons. I grabbed them and headed to the checkout to buy a gift card. My 20-something soon to be cousin-in-law could take herself on Triple B shopping spree and buy whatever was missed on her registry later. The checkout line was a near miss for me too. My anxiety was taking over as I was realizing that everyone had 63 expired coupons and the cashiers were having computer troubles. I switched lines and nearly left. (This is why I love free shipping codes and online shopping!). But I stuck it out, flop sweat and tiny tears running down my face. I bought the spoons and the gift card and got the heck out of dodge. A quick stop at a neighbor's garden for some peonies and I was back in business. In the end, I have to say, I was really pleased. Not only with how cute the gift turned out, but that I didn't bail on the mission to buy something before my anxiety got the best of me. 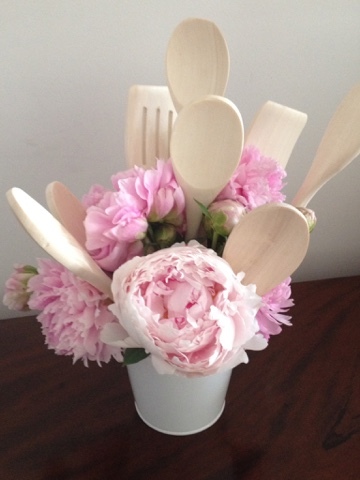 So for those still reading, I simply took a little white metal pail that I had on hand in the gift bin and made a bouquet with peonies and wooden spoons. I added a card (that included the gift card of course) and that was it. I didn't even add any ribbon as I thought it looked lovely just like that. The bride loved it and it felt good to get a little creative with my gift.